“The fire in my belly comes from learning and seeing how corporations like Monsanto, Nestlé, and McDonald’s do everything for profit — risking people’s health, environmental protection and safety, and people’s livelihoods in the process,” says Alexa. As a national campaign organizer for the food campaign, Alexa is taking on the corporate control of food that corporations like Monsanto and McDonald’s represent. She works with activists, educators, health professionals, and other constituencies to challenge McDonald’s abuse of our food system and end its marketing to children. 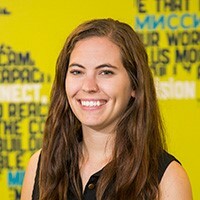 Prior to joining staff, Alexa worked as a Green Corps organizer. In that position, she launched and led grassroots campaigns in Seattle, Baltimore, and Bethlehem, Pennsylvania to challenge antibiotic overuse on factory farms, stop chicken waste from running into the Chesapeake Bay, and stop the use of harmful chemicals that are decimating bee populations. She studied environmental studies and sustainable food systems at Brown University. Alexa loves maps of any kind: the world, a neighborhood, a forest, a city…. “I’m fascinated by how much they influence how we view the physical spaces we inhabit, and how inherently political they are, drawing boundaries and determining points of origin and perspectives,” she says.